Rand Paul's rise to prominence from freshman Senator to populist leader of the GOP is eerily reminiscent of the rapid rise of Barack Obama only a few years ago. Paul, however, unlike Obama, has generally demonstrated a conscience and common sense lacking in virtually every other high-profile DC politician today. This is no doubt the cause of his ascendancy in the public eye -- while his father's energized-if-small political base may have gained him the Senate seat, Rand Paul has proven, warts and all, that he is by far America's best senator from both the libertarian and the conservative perspectives. On top of this, he appears to have some crossover appeal to the Left in the areas of foreign policy and civil rights issues. If America's political system were not completely corrupted, Paul would almost certainly be the next US President (arguably like his father before him might have been). The younger Paul is different from his father Ron in a number of ways that perhaps allow him greater conservative appeal but also cause pure libertarians to raise an eyebrow or view him with suspicion. In between his well-executed libertarian stunts, Rand will kowtow to the GOP establishment and make occasional statements which make die-hard supporters of his father flinch. The ideological differences between father and son are mostly outweighed by the similarities but nevertheless appear on their astrological charts. 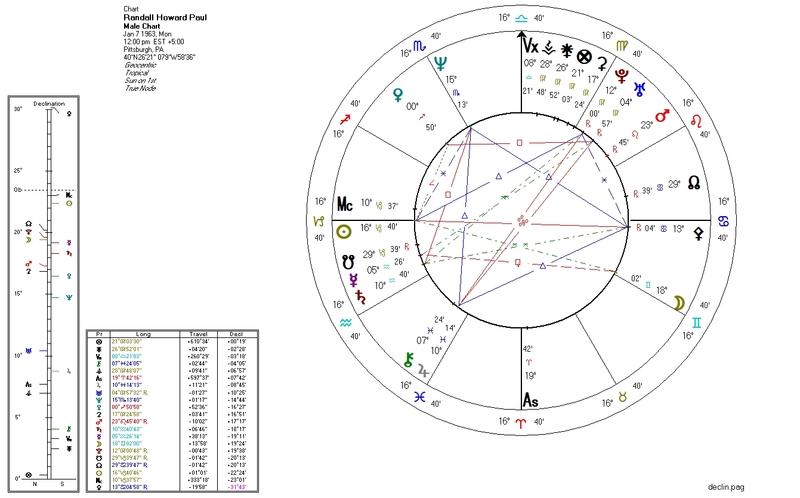 As seen before, a "perfect" libertarian chart for Ron Paul: Pallas conjunct Sun with zero mitigating factors (hard aspects from Jupiter, aspects from Pluto or the South Node to Pallas or her ruler). 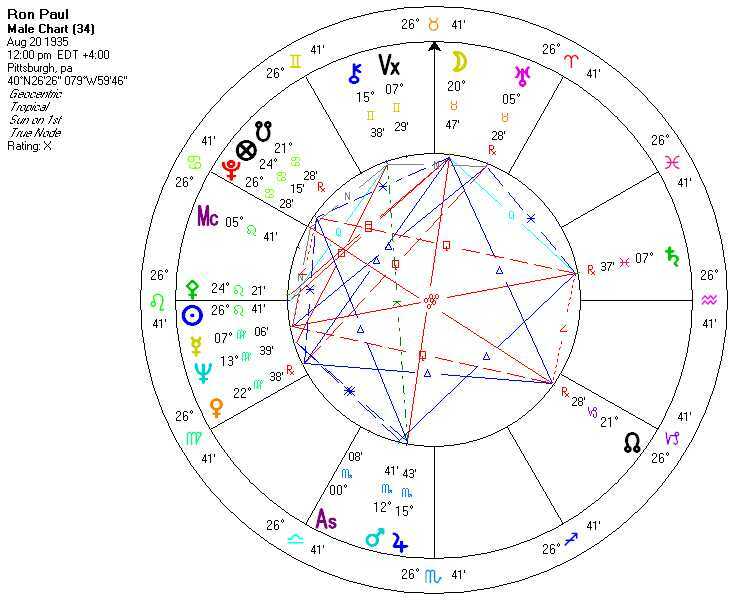 Sometimes, with such a chart a "left-libertarian" emerges, but the North Node trine to Venus eliminates that possibility. Rand's libertarian factors are likewise strong, with Pallas opposite the Sun and quincunx Saturn, ruler of both Sun and Mercury. However, this is tempered by Pluto sextile to Pallas and the South Node quindecile to Pallas. Nailing his conservative credentials is the North Node trine to Venus that he shares with his father. Politically speaking, this is an echo if his father's chart with a little of the "libertarian" taken out: exactly as we would expect from his very good but not "perfect" libertarian performance in the US Senate. Rand Paul's chart indicates an ethical basis much stronger than that of his recent detractor, "Pork King" Chris Christie. Naturally, this means that the political establishment will do everything in its power to see that Christie comes out ahead of Paul.